Oh dear - it seems I've neglected this blog for a whole month. I'd like to say it's because I've been spectacularly productive in other areas of writing, but even though this is a blog dedicated to fiction I don't think I can get away with such blatant fabrication. I have added more to the novel-in-progress, which has now reached something like 97K words. This feels like quite an achievement, although what I was hoping would be a freewheeling-downhill rush to the finish has turned out to be an arduous uphill slog. I'll get there, eventually. I submitted a couple of stories to competitions, most notably the Bath Short Story Award and the Bristol Prize. A good result at either of those would be very welcome. The most significant thing to happen in my writing life recently has been the arrival from Irish publisher Forum Publications of a contributor's copy of Expression, their study guide to Leaving Certificate English Paper 1. I have to confess I'm not fully up to speed with the Irish education system, but I'm guessing that the Leaving Certificate is more or less the equivalent of the UK's GCSEs. 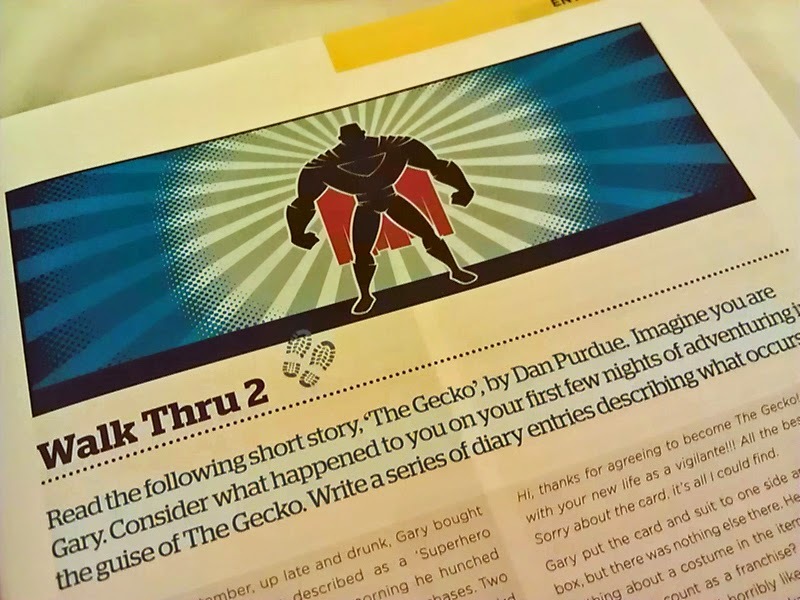 As I mentioned recently, Forum approached me out of the blue to ask whether they could use my story Gecko in one of their study guides. I agreed and almost immediately wondered if I'd regret doing so - I mean, what if they used it as an example of terrible writing, or pointed out all the poor choices of punctuation I'd made, or some other humiliating exposé of my shortcomings as a writer? I'm pleased to report they've done no such thing. The story's used as a walk-through example of a writing exercise in which the students are asked to read a portion of the story, and then write a sequence of diary entries that pick up on the tone of the piece and describe what happens next. At first, I was a little disappointed they hadn't used the whole of my story (it cuts out about a third of the way in, when unlikely superhero Gary is about to set off on his first crime-fighting mission). But obviously the whole point of the exercise is to take an incomplete story and let the students' imaginations take it wherever they see fit. It's exciting to have one of my stories used in this way, and I'd be fascinated to see what students come up with, although I expect it's pretty unlikely I'll get the chance. Overall, this has been a thoroughly positive experience. 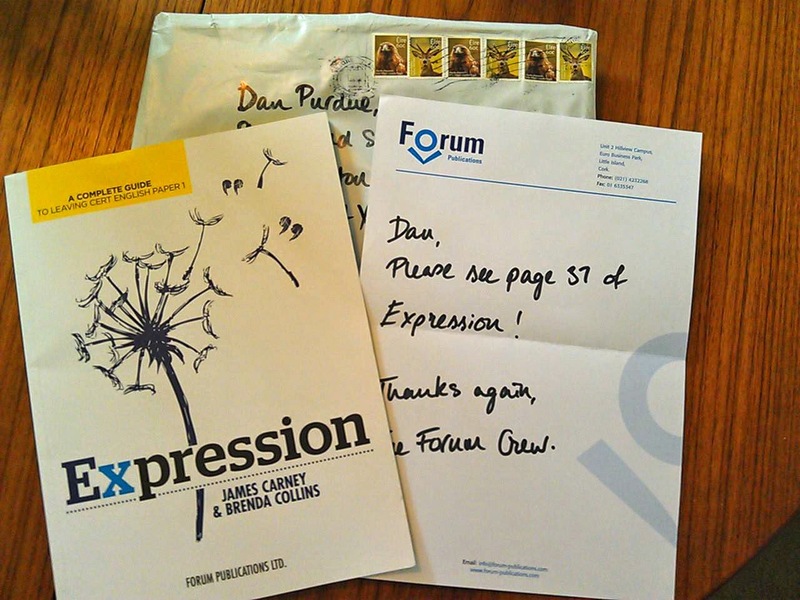 Forum Publications have been a pleasure to deal with and Expression is a book I'm looking forward to reading in more detail - it has some very interesting extracts and several of the writing exercises look like they'd be worth a go. You can see a great deal of care has gone into putting it together and they've done a great job of presenting Gecko (although their version of Gary appears considerably more dynamic than mine ever did). I just hope the students enjoy the story and the writing exercise. WOW! That's like the ultimate dream - to be a writer who appears on exam papers. You've made it, Dan! I'm no expert on the educational system in Ireland as we follow the UK system here in Northern Ireland but I always thought the leaving cert was the same as A' levels. 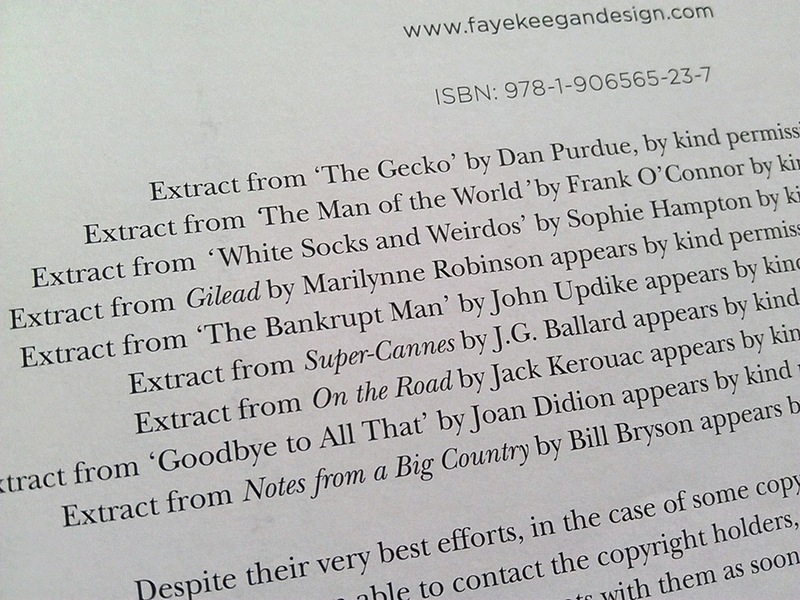 Terrific to have made the exam paper - and form snippets of other writers' experiences, you were lucky to be asked as opposed to having your work used without seeking your permission first! Well done with the novel progress, too - almost there! Good luck with the comps, mister - hope your winning streak continues! It's pretty bad if people you know have had work pinched in the name of education, Rachel. As I've said, Forum were extremely professional and paid upfront, which is about as good as it gets. I wouldn't hesitate to work with them again if I ever get the chance. Thanks for the competition wishes, too - Bristol is about the only comp I've been entering every year since I first heard of it. So far, not even a longlisting. Fingers crossed!